H. Michael Robin arrived in Detroit from his native Baghdad, Iraq, in 1968. The Chaldean immigrant found a job loading potato chips onto delivery trucks. That modest beginning led to Grandpapa’s, a snack food manufacturer that is part of Robin’s $15-million-a-year snack food business. From a newly renovated 140,000-square-foot factory at 6500 Davison in Detroit, Robin ships pallets stacked with cheese curls, cheese balls, and other snacks around the globe. Locally, Grandpapa’s may be best known for its line of pork rinds, although that particular snack food is just the tip of a business operation that ships 99% of its production overseas. From loading trucks to owning a far-flung export business was a journey of hard work and luck and seizing every opportunity. The biggest challenge for Chaldean family businesses is being isolated from the outside world says small business consultant Norman Haisha. Chaldean’s work long hours, weekends, and holidays. The incredibly long work schedule is a huge sacrifice. Another is the boundary issue. Chaldean business leaders are often forced to look at all family and business challenges as being intertwined. So they’re making business decisions based on family issues and vice versa.Great Chaldean family businesses share certain traits: loyalty among the team, vigilance and competitiveness in their fields. Those that pass successfully from one generation to the next have a sense of cohesion because, deep down, Chaldean family members really do care about each other and they can get through the hard times. They’ve found ways to manage conflict—not always resolve it, but manage it. They’ve also figured out ways to make decisions when there are differences of opinion. Yet, real pitfalls lurk. Michigan, USA – "Chaldean business owners prove they believe in Michigan. They put their money where their mouth is," says Ashley Hanna of the Chaldean Education and Career Center. "Despite the high business taxes and anti-business environment in the state, Chaldeans continue to reinvest, improve, and open new businesses in their local communities." On Washtenaw Avenue in Ann Arbor, Mark Yaldo has committed hundreds of thousands of dollars to the community by becoming the new owner of an abandoned and blighted building on 3555 Washtenaw. Yaldo has been spending money all year working with contractors to open an improved and upgraded Marathon brand fuel station and convenient store. Michigan, USA – Back in September 2008 Chaldean businessman Sal Yono received devastating news that his Pro-Hardware business on Davison near Dexter was burnt to the ground. The fire completely destroyed the 60 year old hardware store and left a dilapidated neighborhood in even worse condition. People in the neighborhood were shocked to learn Yono would rebuild as more and more residents and businesses were fleeing the city. Residents cheered when the hardware store re-opened with a million dollar investment by the owner. Many of the people who work at the hardware store can walk to work. The $1 million investment raised more than a few eyebrows in an area where abandoned and boarded up homes dot the landscape. Michigan, USA – “It is hard enough to make a living in Michigan. Now we have to give up the right to protect ourselves when our lives are being threatened. This state is getting way out of control,” says Andrew Gabara, of Clinton Township. Scott Zielinski, who was found guilty and sentenced to prison for the November 2007 robbing Nick’s Party Stop in Clinton Township sued the store owner and employees from prison for beating him up during the robbery. John Acho, and three employees including Acho's nephew Justin Kallo, who shot Zielinski twice were named in the suit. Zielinski, 23, filed the lawsuit in April after he was shot while robbing the store on Cass Avenue, south of 19 Mile Road, near Chippewa Valley High School. Zielinski, wielding a knife and wearing a mask, entered the store about 7:30 p.m. Nov. 15, 2007, and demanded cash and cigarettes. As he fled out the front door carrying a bag of money and cigarettes, he was shot in the arm. Baghdad, IRAQ — Efforts by Western and Iraqi business leaders help secure a new chapter in Iraqi’s economic stability and growth. A major breakthrough for Iraq’s oil industry is made after three international oil consortiums accept Iraq’s terms to develop two oil fields. American Iraqi Business Group (AIBG) chairman, Sam Yono shares that recent developments have changed; more companies have agreed to meet Iraq’s price requirements for oil. Yono leads the largest consortium of independent Western businesses seeking to conduct business in Iraq. AIBG offers education and assistance to Iraqi and Western corporations on securing bids from Iraq and better understanding business opportunities. The business group helps to form collaboration, consortiums, and build synergies to meet the needs of the reemerging Iraqi market. After a successful endeavor of a winning bid for BP-China’s CNPC consortium which bid $2 per barrel produced to develop the 17.8 billion barrel Rumaila field with a targeted production of 2.85 million barrels per day, up from its current nearly one million barrels a day, more oil consortium’s sought to bid more competitively. AIBG reports that they can now share that, that a total of three other consortiums also were awarded. One led by Exxon Mobil and Royal Dutch Shell, another by ConocoPhilips, and a third by Russia’s Lukoil. When sales slump due to a slow economy, a Chaldean business owner’s first inclination is often to cut the marketing budget. After all, one has fixed costs and cash flow can be irregular. But marketing should be the last activity Chaldeans eliminate or you risk an even faster downward spiral. Advertising your business and attracting new customers must be an ongoing process, and there are many things Chaldean entrepreneurs can do that cost absolutely nothing. Professional event and meeting planners are always looking for presenters and workshop leaders for conferences. Chaldean entrepreneurs can research contact names in the Directory of Event Planners or partner with a local church, community center, or event planner to organize a community workshop related to your expertise. When you do get the opportunity to make a presentation or speak to group of people, be sure to collect business cards for a drawing to win a book or other prize related to your business. The U.S. and the U.K. may be mired in what was once thought of as a Third World style of financial crisis, but what was once considered the Third World is not. Local, state, and national governments in both America and Europe are seeing a significant spike in crime and fraud. All experts agree that the very best way for Chaldeans to prevent an armed robbery is to send a message that your business is not an easy target and not worth the effort. In this article, www.CHALDEAN.org covers the most helpful tips in preventing armed robbery for Chaldean small business owners. Yono is referring to the book titled the Richest Man in Babylon written by George Samuel Clason which gives financial advice through a collection of parables set in ancient Babylon. Through their experiences in business and managing household finance, the characters in the parables learn simple lessons in financial wisdom. By basing these parables in ancient times, but involving situations that modern people can understand and identify with, the author presents these lessons as timeless wisdom that is as relevant today as it was back then. Chaldeans should know what their rights are when renting and you don't have to be expert in landlord-tenant law to protect yourself. Chaldeans are reminded to review their rights when renting or leasing and to always read the agreement before signing the dotted line. Laws that protect both landlord and tenant have become so complex that understanding your rights can be difficult. Since landlord-tenant law varies by state, the key is knowing your rights -- preferably before you even sign your rental agreement. Understanding your state law and the terms of your lease are your best guarantees against future problems. Michigan, USA - Federal tobacco taxes are set to go into effect April 1. The biggest federal tax increase will hit roll-your-own tobacco, rising from $1.10 per pound to $24.78 per pound. Store-bought cigarette taxes will head from 39 cents per pack to $1.01 per pack. The state tax for store-bought cigarettes stands at $2 a pack. Chaldean retailers that sell tobacco say customers are stocking up and driving demand. Stores that sell loose tobacco and cigarettes are clamoring to keep their inventory stocked. Unhappy store owner John Kallabat of Canopy Bottle & Gourmet Shoppe in Brighton wonders how sales will fare starting next month. His store sells cigars and cigarettes, but no roll-your-own tobacco. "It seems like every time they decide to put a tax increase on something it's always beer, wine or liquor or tobacco, and that's our livelihood," Kallabat said. Gov. Jennifer Granholm's budget wouldn't touch Michigan's $2-per-pack cigarette tax, it would slam other tobacco smokers, chewers and puffers who've been a favorite tax target for states to balance budgets and, in the name of good health, discourage tobacco use. Just a few weeks after Salim Bashi was laid off as manager of a taxi cab company in Michigan, he found himself driving through Detroit with his 11-year-old son, Sam. Sam knew that his father was unemployed and that money was a concern in their family. Salim says, “We stopped at a red light, and saw a homeless man pushing a shopping cart. I could see in my son’s eyes he was worried. I asked him what he was thinking. First he was scared to answer. He wanted to know if we would be like that man with the shopping cart." www.CHALDEAN.org speaks to several Chaldean fathers about how losing a job can affect family life. More Chaldean stay-at-home moms are using their creativity, experience and education into starting businesses on the side. No matter if your goals are as simple as adding to the family’s income or as big as building a million dollar company, starting part-time from home is a great way to test the business waters. But between helping the kids with complex homework assignments, shuttling them to countless activities and volunteering at their school--all while managing the household and trying to carve out a little time for yourself--where do they find the time to start a business? www.CHALDEAN.org interviews Chaldean stay-at-home moms who have been able to successfully juggle their family and business, all from their home headquarters. The bold move by Oraha and his fellow group members are researching plans to move an entire community. “We are looking into which states would be best for Chaldean business families. The place has to be business friendly, good schools, ability to build or lease a church for Chaldean services and near banquet facilities for family parties, and inexpensive air travel for continued family connections.” says Oraha. The Chaldean grocery store chain owner was reluctant to say which states the group is leaning towards. Michigan, USA – "They were buying a $10 bottle. Now they're buying a $6 bottle," said Mike Acho, owner of the Wine Cellar party store in Waterford. "People don't have the money. They're not working, but they still want the alcohol, so they buy the cheaper stuff." Chaldean business leaders within the Merchants of Michigan association say the state is heading towards the cliff’s edge. Michigan remains the worst state in country. It has the highest unemployment rate in the country, a continually slumping economy and one of the highest foreclosure rates in the nation; experts say much of the increased drinking may be related to people trying to drown their sorrows. State records agree with the opinion sharing that more customers are choosing to drink at home instead of bars and restaurants. Alcohol purchases nationwide have risen about 2%, total sales in Michigan have nearly doubled that, 3.5%, with residents of the Great Lakes State spending $895 million in 2007. The increase is in spite of a loss in the state's population of more than 46,000 people last year. Bajoka’s aggravation is not rare. Taxpayer groups in the “Fruit & Nut” state are also fuming and vowing to go to court to initiate a referendum to halt nearly $10 billion in recent tax increases Democrats passed in a secret special session last Thursday. So which are the best low-tax states welcoming new business leaders and encouraging economic growth? Just follow the trail of Chaldeans…. Michigan, USA - Chaldeans time and again show their prowess to succeed. "Hard work, exceptionally creative, and humble," says Ashley Polus, a guest at the prestigious Southfield Skyline business award ceremony. "Ron Jona made us all proud. I was pleasantly surprised to learn he was the man being honored. As I said earlier, hard work, exceptionally creative, and humble. He deserves it," she said. Southfield is home to over 9,000 businesses including more than 80 "Fortune 500" companies. The City of Southfield is the premier business address in Michigan. With more than 27 million square feet of office space and over seven million square feet of retail and industrial space - Southfield is truly Michigan's undisputed business center. In fact, Southfield boasts more office space than the central business districts of Cleveland, Cincinnati, Detroit, Indianapolis or Kansas City. Michigan, USA – While the automotive giants and industry big houses are off begging for bail-out funds, real business leadership, entrepreneurship, and innovation are busy finding new ways to better serve customers. Ask John Abbo, owner of Mobil station at Clyde Road and U.S. 23 in Hartland Township, who has transformed the gas station into a convenient one-stop-shop. "The general trend is consumption of petroleum has gone down; it has affected our industry a lot," Abbo said. 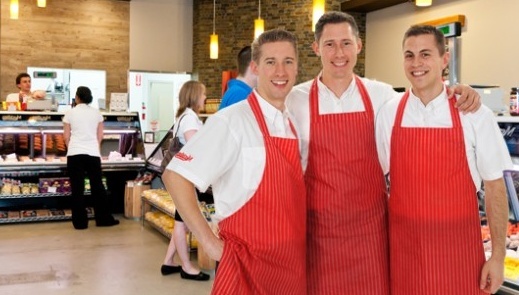 "We're fortunate that we were able to do the different type of things that we did, like put in a new grill, and we've now converted the store into a market. Gas stations aren't what they used to be." Abbo has expanded offerings at his 5,000-square-foot station, which he now refers to as the "Hartland General Store," including adding a full liquor collection, expanding Hartland Express Pizza into a grill and selling Michigan Department of Natural Resources hunting and fishing licenses on site. Frozen foods, a deli and other offerings are also included in the renovations, which are expected to wrap up within the next month or so. In all, Abbo said, he's poured nearly a quarter of a million dollars in improvements. Michigan, USA – Another remarkable business light shines through the darkness of Michigan’s economy. Alpine Marketplace in Linden, Michigan, against all business odds refused to allow Michigan’s economy to get in the way of offering Linden residents the very best. Michigan, USA – Obama’s ties to Chaldean business leaders is not limited to Chaldean British billionaire Nadhmi Auchi and Chicago millionaire Antoin “Tony” Rezko. Auchi’s connection to Saddam Huseein and his loan to Obama of 3.5 million dollars through the Panamanian company Fintrade Services SA for his home on 5050 South Greenwood Avenue in Chicago, caught little media attention in the political campaign. Despite the fact that Obama’s appeal to Chaldean business owners isn’t in the small businesses policies he campaigned about, Chaldean business leaders are going to make the best of popularity. Take for example, gas station owner Sam Bazzi in Detroit. Bazzi is capitalizing on the President Obama frenzy hoping to cover the eventual tax hikes his station and small business like his will face once Obama takes office. The owners of the independent gas station re-branded a few months ago, including the roof, the sign, the pumps and even the awnings. The new Obama Oil on the corner of Wyoming Street and Plymouth Road in Detroit is a brilliant marketing move that has been “pumping” up customers and ringing in profits. Michigan, USA – Chaldean businesses will soon feel another round of pinches as Michigan continues its economic free fall. Chrysler LLC, whose owner has been in talks to sell the automaker to General Motors Corp., said Friday it will cut 25 percent of its salaried work force starting next month and warned that it will make more restructuring announcements soon. Chrysler, which has about 18,500 white-collar workers, said Friday it also will cut a quarter of its contract employees — those who work for other companies under contract with the automaker. About 5,000 people are likely to lose their jobs, although the company would not say how many contract workers it has. Michigan, USA – Chaldean entrepreneurs have always fought to compete against the cold giant retailers. “We do this on a personal level. We reach out to our customers and make sure they are happy. We support the community and give back,” says Eddie Katoola, manager of Grail of Gorcers in Highland Park. Grail of Grocers fresh produce and meats remind customers of the days long gone, when butchers knew your name and shared community recipes. The success of Chaldean business owners is there ability to offer customers wonderful products and services and great prices. It’s the reason why so many Chaldean businesses have been able to outperform major competitors. The long standing tradition of offering valued goods is remarkable. Across town, Johnny Karmo, owner and manager of Market Fresh is offering his customers a most unique product. Karmo wants his customers to have the most unique pumpkins on their block. Michigan, USA – Chaldean business owners are disappointed over continued efforts to stain independent grocers. “This is bad. These people don’t speak for us. Our produce and foods are fresh. This is just another way to take money from stores owners and give them nothing in return,” says Kamal Dally, owner of Riverside Liquor in Detroit. Dally is upset over an initiative announced at a private business meeting among Chaldeans, under the approving eye of Detroit’s new Mayor Ken Cockrel Jr. that Chaldean store owners be asked to join a “Guaranteed Fresh” campaign for their stores. Dally, and many other business owners feel the business group sold-out the Chaldean business community to gain political points with the new mayor and raise money for their own pet projects. “They don’t care about Chaldean businesses. All they care about is using the community name to take money from those who work so they can play golf,” says Dally’s son Thomas. “Why didn’t they propose the city start a ‘Guarantee Response’ from the police every time a Chaldean store calls for help during an armed robbery or theft? Michigan, USA - Today, many homeowners are unable to make their monthly mortgage payments due to job loss, health issues or an adjusting ARM and are opting to do a foreclosure. The government bailout of banks will not offer much reassurance and those choosing to walk away from their home, especially Chaldeans, might consider a few things first. A foreclosure ruins a borrower’s credit for about 10 years, making them unable to buy another home, purchase a new car, impact businesses loans, or even prevent them from getting a new job. Shrewd Chaldeans are considering a little known option for homeowners called a “Short-Sale”. California, USA –Chaldean business leaders are fast feeling the pinch as banks are reluctant to even give payroll loans on verified accounts receivables. With the U.S. Economy on the verge of bankruptcy Chaldeans are still befuddled with how this could be possible. It all began with the CRA (Community Reinvestment Act) that quickly turned into a thief’s bank in the early 90's. The Los Angeles Times reported that, starting in 1992, a majority-Democratic Congress "mandated that Fannie and Freddie increase their purchases of mortgages for low-income and medium-income borrowers. Operating under that requirement, Fannie Mae, in particular, has been aggressive and creative in stimulating minority gains." Raddison is right that McCain was a leading proponent of the corruption in Fannie Mae and Freedie Mac, that have caused the economic stumble of America. Congressional record shows that back in 2006 McCain hammers them for falsification of financial records. Ironically the leaders of the corrupt companies, including Franklin Raines and Jim Johnson, both worked as advisers to Barack Obama. Detroit’s Troublesome Mayor Resigns, Heads to Jail, and Forced to Pay Millions. The infamous Democratic Mayor was not shy to share his dislike for small businesses in the city. He often complained and organized attacks against convenient stores, gas stations, hardware stores, salons, and dollar retailers. “He upset and offended so many people. He was arrogant and thought he was a lion. Now he is a mouse. When you are sel;fish and not humble, this is what happens,” says Nalou. Kilpatrick will shamefully resign, serve 120 days in jail, and pay $1M restitution. Michigan, USA - Often food of the ethnic variety is a cultured taste where so much is tied to familial memories and good times. A whiff of a favorite dish can transcend you back to a fond experience. Add to the memories a combination of authentic spices and learned taste buds and you have a native’s perspective of their own cuisine. Is Your Bank Stealing From You? Although the accolades and praise rings true to many, Chaldean business owners still remind budding entrepreneurs to be mindful of banks when doing business. California, USA – The event is planned from 9 a.m. to 3 p.m. Saturday and Sunday in the southwest parking lot of the El Cajon Wal-Mart, 605 Fletcher Parkway. The event is free and open to all county residents. E-waste includes old computers, TVs, stereo equipment, phones and other items that can't be thrown in the trash. Household appliances and batteries will not be accepted. Also on Saturday at the El Cajon Wal-Mart, San Diego Gas & Electric is partnering with Electronic Disposal Group for a light bulb exchange. There are many things involved in establishing a new business. “One of the important steps is to protect yourself from hidden liabilities,” says tax clearance expert Debbie Kassa. When buying or establishing a new business in Michigan, Taxpayers are required to meet certain obligations under Michigan law, including filing tax returns on time and with the correct payment when required. Kassa is a decade long veteran of the Michigan Department of Treasury where she was in charge of reviewing Tax Returns from 1040's to the SBT & SUW returns. She also worked 7 years in the Tax Clearance Division reviewing Business accounts for Businesses & Corporations seeking a Tax Clearance. The city’s mounting problems seem only to get worse. Detroit’s embroiled Democratic Mayor Kwame Kilpatrick has been sentenced to jail time. Once again across the nation the city has come under scrutiny, costing city business owners and residents considerably. The state of Michigan remains a battle ground for the presidential campaign and the city’s issues is casting a very dark cloud. Democratic Presidential candidate Barrak Obama’s campaign made it clear that the Detroit mayor was not to attend any of Obama’s events, fearing negative attention. The termination fee in particular upset many customers. Cellular phone companies would sell contracts to customers and if a customer terminated their contract early an additional fee was added. However, a Superior Court judge in California has ruled that the practice of charging consumers a fee for ending their cell phone contract early is illegal and violates state law. Michigan, USA - It goes without saying that the Chaldean community holds remarkable wedding events. Rich in Catholic tradition and Chaldean heritage these incredible events require a competent and experienced professional. The planning that goes into such affairs are overwhelming. Hiring an expert who has the right connections with the best vendors, has learned to become an ace negotiator to get you the best value or 'deal' for your money, and knows where to find all those unique and dazzling touches to transform your wedding into an absolute fantasy. It was not so long ago that wedding consultants were thought of as a luxury to be used mainly by the wealthy and elite. Times have changed. According to Modern Bride Magazine, over 50% of all American couples who married in 1999 used the services of wedding consultants, also commonly referred to as wedding coordinators, bridal consultants, and wedding planners. In the Chaldean community that percentage is even higher and continues to rise. In Michigan, one impressive Chaldean wedding expert continues to wow the community and critics alike. Weddings by Dalia, continues to win awards and is now in the finals for Michigan’s best of 2008. The firm placed 5th best in 2007 and now is poised to be the top rated. The Chaldean community is showing their support by visiting the online voting booth and casting Weddings by Dalia as their best choice for Wedding and event consultation. On the site supporters like Nuha Roumayah, Sarah Eskander, Melody Kouza, Vonica Abouna, Jennifer Shunyia, Merfit Yaldo, and Joe Bahri applaud her amazing work, creativity, organization, and insight. For many Chaldean entrepreneurs, the idea of consulting a lawyer conjures up frightening visions of skyrocketing legal bills. While there's no denying that lawyers are unnecessarily expensive Chaldeans can employ these cost saving tips to keep cost down. First and foremost find an attorney you are comfortable talking with and can comfortably share how you feel. The lawyer works for you and if they are intimidating or unwilling to make you comfortable don’t even begin discussing the case with them. Lawyers are a dime a dozen, but each is betting on the fact that you will not do your research or spend the time to clarify the working arrangement, especially when it comes to billing. Michigan, USA - Chaldean American Professionals (CAP) invites Chaldeans and their business friends to a breakfast business network meeting. The meeting will be held this Friday, June 27 in the Southfield Town Center 4000 LaTerrace Mediterranean Restaurant from 8:00 a.m. to 9:00 a.m. in the morning. For a map of the Southfield Town Center, CLICK HERE. The event is open to both Chaldeans and non-Chaldeans. The event is free to CAP members and only $5 for non-members. The event will include continental breakfast and a literature table for business cards, fliers, and literature. Guests are reminded to bring plenty of business cards and to where name badges. The Michigan United Conservation Clubs (MUCC) kicked off an initiative today to convince the legislature to add a 10-cent deposit for water bottles. This is the same group that originally pushed for Michigan to become the first state to require deposits on pop bottles. The idea has come under harsh criticism from Chaldeans and many others in the business community, mainly those that would be responsible for handling all the new empty containers. Ever wonder what you can do to become the next Chaldean Millionaire. Well it is not as hard as you may think. Amassing wealth is more than just being able to earn money. Breaking into the Chaldean Millionaire club requires a good understanding of investment. California, USA - A group of private Chaldean business leaders from California and Michigan has begun exploratory efforts in rescuing a failed commercial building on Broadway in El Cajon, California. The six unit building was forced into foreclosure by El Cajon City Council after ongoing disputes with the city’s nonprofit partner, Heartland. The city entered into a partnership with the nonprofit in 1999 to buy and renovate the rundown building so that Heartland could offer job training and other programs there, but Heartland failed to make loan payments. Due to informal bid discussions on commercial property in California, www.CHALDEAN.org was able to discover the major share owners of the hundred million dollar Chaldean group considering the purchase of the building. Michigan, USA - Chaldean commercial realtors will have more access to a greater number of commercial listings. The additional information will create new opportunities for Chaldean property owners to expand their property portfolios. The Commercial Board of Realtors’ listing information exchange has confirmed that two major commercial real estate houses will begin to share all their historical data and proprietary listings. California, USA – “No Riza Maraka! Who do I blame,” says Anthony Matti of Chula Vista, California. Amid growing concerns of global rice shortage two of America’s biggest retailers place a limit on rice purchases. Wal-Mart's warehouse chain Sam's Club, the largest warehouse and food grocery retailer in the US is limiting bulk purchases of rice this week, citing "recent supply and demand trends". Seattle-based Costco Wholesale Corporation has also imposed limits in some stores on bulk rice purchases. Chuckling over his own sense of humor, Matti does have a serious side. The undergraduate student just submitted his final exam paper titled the Economic Food Web. California, USA – Less than a week after his swearing in ceremony, El Cajon, California’s new police chief, Pat Sprecco, has been the talk of the town in the Chaldean business community. Chief Sprecco replaces Cliff Diamond, who retired Friday and was a strong supporter of business safety and crime prevention. "My goal of course would be to address crime issues in El Cajon, to make it a safe and as pleasant a community for folks to live in," Sprecco said. Chaldean business owners are eager to hear from the new police chief and learn about any new initiatives in preventing and protecting small business owners in the city. “We know Captain Sprecco, well now chief, is experienced, highly qualified, and respectful of small business owners. We look forward to his support and leadership,” said Kalla, who’s family owns Bay Liquor in El Cajon. Michigan,USA - The youth and beauty of a Chaldean is all too obvious. The unique diet, good genes, olive toned skin, frequent cleanings, and skin care management secrets all contribute to the youthful beauty. This unique trait is something the Nordstrom retailer took notice, and hopes to leverage, at the opening of their new store in the Mall at Partridge Creek. The store has contracted with Joanne Recchia-Kallabat’s company SkinOnyx, the U.S. distributor for Italy’s Kleraderm skin care products to make the product available in the cosmetics section of the new Nordstrom. "It feels like I brought Nordstrom with me," she said of her return. The only other U.S. store that carries Kleraderm is the Nordstrom in Troy's Somerset Collection, where they've earned a strong following over the past three years. "Nordstrom calls them 'Kleranets' because they only want Kleraderm products," Recchia-Kallabat said. Kleraderm is an advanced skin care line developed by a doctor in Bologna, Italy. "It really works," Recchia-Kallabat said. "It's been a beauty secret of the stars for years." London, UK- Britain’s Royal Society of Medicine (RSM) had organised a ceremony in honour of Chaldean businessman Nadhmi Auchi, Chairman of General Mediterranean Holding (GMH), and President of the Anglo Arab Organisation (AAO). The ceremony, which took place at the RSM building in London, was in appreciation of Auchi’s efforts in supporting the cause of medicine in the United Kingdom, which included funding medical research projects and sponsorships. Present at the ceremony were a number of Arab Ambassadors, British Lords and MPs, and prominent figures in the medical profession. As a token of gratitude, the RSM has named the main hall in his name “The Nadhmi Auchi Foyer". Every Chaldean business entrepreneur is in business to make a profit. That means having customers, and lots of them. It goes without saying that location is important. Having a hotel by an airport, business district, or entertainment district is a “no brainer”. Opening a store at the crossroads of a busy intersection or highly dense residential area is just as simple. So simple that you will find four convenient stores facing one another or two hotels across the street from one another. Location is one of the primary deciding factors for guests. If the hotels are next door to each other; one isn’t closer to the airport. One isn’t closer to downtown. If the location could sustain a million dollars in sales and there are four stores vying for that million we can safely estimate $250,000 each. Can we? Will each business operate the same? Will each owner carry the same goods or offer the same service? Drive by any corner crowded with businesses and you would be stunned at how similar they are. There is nothing unique about any of them. They are virtually indistinguishable from each other. Limited business entrepreneurs turn to the easiest solutions to differentiate their business. Lower prices or give more goods away. This simplistic solution may be a good short term solution but in the long run hurts the business. The long term fix for any Chaldean business owner is to differentiate their business by offering better service and developing meaningful customer relationships. And this is how to do it…..
California, USA – “Everything I have worked so hard for over the past four years, I have lost in one night,” said owner Andy Kakoz. A crowd of about 50 people gathered across the street to watch firefighters douse the flames of a million dollar discount store in Downtown El Cajon, California. At one point, water from three ladder trucks was being poured on the roof while firefighters on the ground busted windows to pour water on the flames. Firefighters from four agencies fought to bring the fire under control. Even two hours after it started, some flames were still coming of the roof. Michigan, USA - "My clients are bleeding to the tune of about half a million per month," says Shallal, a shareholder in the Southfield, Mich.-based law firm Mekani Orow Mekani Shallal Hakim & Hindo PC. Nearly 115 Chaldean property investors have joined hands to teach Ginn Co. a costly lesson. The federal suit alleges the Celebration-based developer misled them on the investment potential of nearly 130 home sites in four luxury communities in Florida. The Chaldean investors claim Ginn Co. violated interstate land laws, SEC rules, perpetuated a Ponzi scheme after buying lots in Bella Collina, Reunion and other Fla. communities. The Chaldean plaintiffs include well known and respected community leaders outraged over the alleged deceit and deception. Michigan, USA- In a little less than a few years, brothers Matt and Marc Jonna have added their second specialty gorcery store Plum Market in Ann Arbor. Ann Arbor residents have fast filled the isles of the high-end grocery store. "We can't wait for Plum Market to become an active part of the unique community that is Ann Arbor," says co-founder Matthew Jonna. "We're looking forward to creating an environment where friends and neighbors can shop, share and just generally have a great experience." The upscale grocer's 28,000 square feet in the Maple Village Shopping Center takes up most of the space of what was once the Foxtown movie theater. This is the grocer's second location. Its first is in Bloomfield Township. There are also plans for one in downtown Royal Oak in the second phase of the Main North Lofts development and future ones throughout Metro Detroit. Chaldean entrepreneurs know how hard it is to make a buck without shoplifters helping themselves to their inventory. How do you stop them? According to the research conducted by National Retail Federation and the University of Florida, Shoplifters in America account for over $13 billion of the total $41 billion in annual losses due to "shrinkage" (including employee theft, shoplifting, administrative error and vendor fraud). Chaldean entrepreneurs know how frustrating theft can be when margins are slim and continue to get slimmer. Shrinkage eats up 1.6% of the industry's sales--a huge number considering that giants Wal-Mart, Costco, Home Depot, Kroger, and Walgreen post an average profit margin of only 3.6%, according to Reuters Global Fundamentals. What is a Chaldean business owner to do? Chaldean entrepreneurs will mostly agree that buying a business is not simple; in fact, it is almost similar to starting a new venture. The struggle of finding a business that matches your capabilities and investigating the business potential to remain profitable is just the beginning. Buying a business requires the same thoroughness as creating a business plan for starting a business. Edward Putrus, owner of West Coast Electrical Warehouse Supplies in Arizona says the ability to make a good business great is different than creating a new business. Anthony Jurjus, an associate partner in the firm Rosen, Russel, and Silverman Consulting, PLC is a commercial real estate agent and business broker who often helps Chaldeans in finding and buying businesses. “Anyone buying a business needs to do be careful, have a strategy, be patient, and persistent,” says Jurjus. Jurjus suggest Chaldeans follow a 10-step process in guarantying the business they buy is the right one. When Joseph Garmo attended a Chaldean wedding, he never imagined that he would hear the benefits of his own product begin shared by a fellow guest. It was also the moment he realized the power of his connections. He hadn't spent a dime on marketing his product and before him was a table filled with his target market discussing his Check cashing prevention system. Listening to the Chaldean business talk, Garmo realized where the guest had learned about his product. Kalu seems to have his hand on the pulse of the market. Remodeling magazine completed a study of homeowners across America and the result is that the owners aren't recouping as many improvement costs as they could in recent years. In fact, real-estate agents advise clients not to overdo it, regardless of what the local market conditions are like. The investment for any remodeling projects is added to the selling price of the home. Chaldean real-estate agents say that the buyers market is fiercely competitive and sellers will have trouble selling a home with value added costs added to the bottom line. The reason is that asking prices are based largely on comparisons with similar homes in the area, Kalu says. “And in the many markets that aren't exactly booming right now, buyers have more negotiating power over the price of a home,” he adds. California, USA - Chaldeans are very fast learners. All it took was a number of passengers in 1999 that were stranded in Detroit Metro Airport in Michigan to sue Northwest airlines for wrongful imprisonment. The 11 hour snowstorm and Northwest’s decision to keep everyone on board affected 7,000 passengers and ultimately cost them $7 million in an out of court settlement. Unlike Chaldeans in Michigan, Kate Hanni can’t stand the cold. The California resident made that painfully clear after American Airlines diverted her flight for more than eight hours a year ago. The law suite filed by Hanni and another passenger alleges false imprisonment, fraud and negligence. Lobbyist groups like the Anti-Saloon League long convinced U.S. politicians that it was in the country’s best interest to give distributors free market protective status. They made the case so effectively that, even after Prohibition was lifted in 1933, most states insisted on keeping alcohol manufacturers far away from alcohol sellers. The favored solution: a three-tier distribution system requiring manufacturers to sell to wholesalers, and wholesalers to sell to retailers. New York, USA - Every day Chaldeans are bombarded with one persuasive message after another. These messages convince Chaldeans not through reasoning, but through manipulation. They target the foolish by agitating emotions, exploiting insecurities, capitalizing on the ambiguity of language, and by bending the rules of logic. Most all businesses use marketing and advertisement to help sell their products. However, there are industries that have emphasized branding in order to overcharge gullible consumers. They target those with little achievement to their name, those who are insecure about their look, weight, or reputation, or those unsure of themselves. Some key industry leaders are experts on preying on the insecure and those with low self-esteem and a desire to belong. “It is like make-up for their insecurities,” says Semara Rayes, a marketing researcher and ad campaign specialist who works for an undisclosed top New York advertising firm. “We conduct the research and marketing campaign that gives useless products some use.” Semara attests to using psychological warfare against vulnerable consumers in order to get them to buy a specific clothing line or convince them that jewelry is important or to engineer a new fad. Lots of research has gone into the study of mass consumer manipulation. The result is a strategy that is simple but closely guarded called Complimentary Emotions says Semara. “First, we expose the consumer to a subtle negative emotion and then make an overt claim that the showcased product can make them feel happy.” That strategy has made all the difference in getting consumers to spend and at times to go into severe debt. In this one-on-one candid interview Semara Rayes explains the inside tricks of the fashion marketing trade. Polis refers to Nat’s Candy. A custom jewelry boutique based in Arizona and owned by Chaldean entrepreneur Natalie Karmo. The former actress turned artist was featured as Arizona’s top artist. Her company has been featured in top fashion magazines. Her jewelry line includes unique designs of gemstones and Swarovski crystal. The limited edition production jewelry has made her the talk of the town. One question that Chaldeans must answer when starting a business is “What legal business structure is the best for their business?” This is one of the most important questions a Chaldean entrepreneur must ask. Particularly for Chaldeans who plan on providing goods or services to residents trapped in high crime areas. The business legal form can have significant implications on the amount of money Chaldeans pay in taxes, their personal risk in the business, as well as their ability to get loans or raise money. Prior to making a final decision Chaldean entrepreneurs should religiously explore their options. Chaldeans have a handful of options when choosing what legal form their business is to take. There legal forms are sole proprietorships, partnerships, limited liability companies/partnerships (LLCs /LLPs), and incorporations (either C-corporations or S-corporations). The idea is to structure your business in the best way possible to help you succeed. What follows here are the issues of liability protection, business appreciation, active versus passive income, and retrained earnings in the business. Chaldean entrepreneurs should understand how their business should be structured in order to help them when dealing with these issues. California, USA - Chaldeans are fast learning the importance of legislation and politics and how the two can impact their business bottom line. The Chaldean Caucus has long banged the drums of needing business savvy politicians from local to federal positions. In Michigan, the Caucus moved forward in promoting and supporting three Chaldean political hopefuls. Two of which have extensive business backgrounds. Michigan, USA - Detroit-based NextEnergy, the state's alternative energy incubator, was excited when Mark Yaldo decided to get involved. Mr. Yaldo, owner of the Southfield Sunoco became the first Ethanol 85 alternative fueling station, located in Southfield Michigan. The pioneering entrepreneur boldly claims that caring for customers and the planet are not contradicting concepts. His mission to help establish and encourage other entrepreneurs install biofuel pump options throughout metro Detroit struck a cord with the state’s Governor. Governor Granholm personally made a visit to help Mr. Yaldo launch his grand opening. The two stood side-by-side as they cut the ceremonial red ribbon and opened the biofuel pump. To further entice and encourage customers to use the alternative fuel, Mr. Yaldo offered a gallon of E85 way below cost at $2.49. Michigan, USA - A once dilapidated and run-down historical facility has been rescued. A reincarnation of the venerable old Stephenson Club has opened as the Stephenson Haus banquet facility. Officials from Hazel Park and Madison Heights recently welcomed new owners Frank Sitto, Sam Denha and Amer Dado at a ribbon-cutting ceremony. The Chaldean business leaders took charge and rescued the historical darling and brought back the magic. The Stephenson Haus banquet facility will be able to serve over 600 guests in elegance. Claifornia, USA - Learn how to adapt your marketing strategy to the needs and wants of the growing Chaldean demographic. If they're not on your marketing radar, chances are you're already one step behind your competition. The Chaldean population is growing exponentially, and their purchasing power far outpaces other cultural groups. According to CulturalIntelligence, the Chaldean groups in southeast Michigan and California spending power has skyrocketed and is projected to grow significantly stronger. The latest U.S. Census Bureau figures demonstrate high concentration of Chaldeans with large amounts of dispensable income. Michigan, USA - It is a seller’s market in many Chaldean concentrated states. While the economy is doing great in states like Illinois, Nevada, Arizona, and California, Michigan’s economy continues to free-fall. In Michigan the real estate opportunities are far and wide as the buyer market continues to heat up as homes are foreclosed, residents move out of the state, and businesses close. Chaldeans can seize on the opportunity of depressed Michigan economy by finding and securing an undervalued piece of property. There are many advantages of becoming a home owner. This includes the appreciation, tax benefits, a higher quality lifestyle, a more stable family life, and obviously the investment. Chaldeans are able to better prepare themselves when planning to purchase a home. For such occasions consider these 5 Chaldean home buying power tips. Illinois, USA - More than half of Chaldeans will pay someone to prepare their tax returns this year. An even larger number have paid thousands of dollars throughout the year on bookkeepers and accountant services. How do you know you received a great value? Can you negotiate your fees? Tax professionals like any other profession talk shop and share insights. They tell other professionals things they won't tell you, including stuff that could help you deal with your own tax pro and maybe even save you money, if only you knew. Chaldean business consultant Raad Yono says Wal-Mart’s alignment with liberal causes is out of threat and fear. “Wal-Mart has been bullied around by Democrats and forced to give to causes they traditionally would not align with,” says Yono. The consultant responding after www.CHALDEAN.org reported of Wal-Mart’s contribution to homosexual causes and decision to carry the abortion pill. Wal-Mart may be expanding in the People's Republic of China, but here in capitalist America the low-price retailer has become the Democratic Party's favorite pinata. The media like to portray this as a populist uprising against heartless big business. But what they don't bother to disclose is that this entire get-Wal-Mart campaign is a political operation led and funded by organized labor and the Democratic party. Shaya adds that Christians today are obviously under attack; their holidays are corrupted, stripped, and commercialized into meaninglessness by anti-Christian groups. As the Christmas season draws near Chaldeans like Shaya are making clear they are steering away of businesses that attempt to dilute or corrupt the Christmas holy day. Best Buy has announced they will be using "Happy Holidays" this coming Christmas shopping season, and they will not be using "Merry Christmas." Michgian, USA - "There's over 100 growers within a two-hour drive from here ... we're talking about Michigan blueberries, peaches, apples and honey," he said. "Whenever we're able to support our local farmers, that's what we're going to do," says Mathew Jonna. Rebounding from their sale of the Merchant of Vino, the Jonna family has kept a low profile. According to Matt Jonna, son of Merchant of Vino owner Ed Jonna and a managing partner in the family business, Whole Foods approached the Jonnas with an offer too good to resist: 1.03 million shares of common stock, valued at an excess of $40 million. Michigan, USA -- Zaytoon -- it means "olive" in Arabic -- is as fresh and appealing as that suggests. It opened this summer in an airy, high-ceilinged space that has housed several previous restaurants. One of them -- La Fendi -- is a direct antecedent of the bright new Zaytoon. Brothers Tony and Raad Samona were partners in that Mideastern spot, as well as the original La Fendi in Lathrup Village. Both closed in 2003. And so after another restaurant tried and failed in the West Bloomfield Township space, Tony Samona's son and daughter reclaimed the address in a strip mall that is pretty remarkable for its international array of restaurants. Chaldeans forced to live in various countries have always turned lemons into lemonades. The optimistic entrepreneurial minds of Chaldeans paired with their work ethic have brought an impressive level of success. Chaldeans living in western countries have seized the entrepreneurial opportunities of international commerce and have begun looking into multinational businesses. www.CHALDEAN.org interviews Issam Habib, Chief Security Officer for International Imports and Exports of Los Angeles, California regarding travel safety abroad when conducting business. IIE has a dedicated team of twenty-two global associates traveling around the globe looking for unique and potential profitable new items. IIE is constantly training associates on travel safety, counterfeit identification, and international business. Issam offers 12 insightful travel safety pointers. Ohio, USA - For years, Randa Shallal has been sweetening up family and friends with a secret-recipe concoction she describes as a "fabulously fudgy cocoa peanut sauce that's great on ice cream, pretzels, cookies, or even just a spoon." Thanks to a new commercial food-processing facility at the Agricultural Incubator Foundation on State Rt. 582 north of Bowling Green, she's found an economically feasible way to begin bottling and selling her "Panda Potion No. 5" commercially. Shallal says, "It was by learning of this facility that I had an epiphany that I could do this," she said. "I always knew I couldn't do anything commercially in my own home. ... I was at a [Women's Entrepreneurial Network] meeting in November when a woman stood up and talked about this kitchen, and it came over me like a wave: I can do this." Michigan, USA - Chaldean entrepreneur Mark Garmo has always found ways to meet the needs of his customers. Mr. Garmo, professes a passion for customer service and his recent appeal before the Grosse Pointe Farms proves just that. Village Food Market shoppers can still expect to be greeted by displays of produce and flowers around the store’s Mack entry.